I had this conversation on Twitter yesterday. That's fine. 37Signals is known for saying no to things in the interest of a better product. 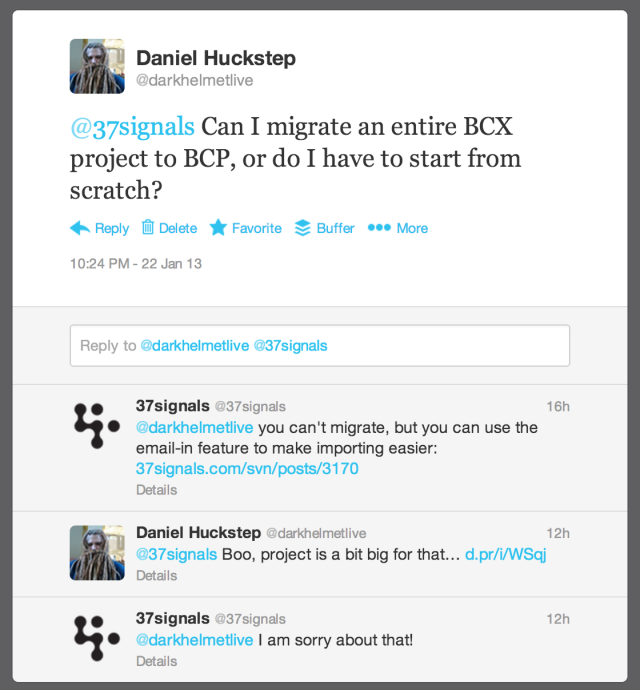 A migrator for BCX isn't exactly something that would add enough value to the product to warrant spending their time on it. I built one. It only took a couple hours to throw together and clean up. It's super basic, but it did the job for me. It handles todolists with their todos and comments, but no attachments. It's not my best code, but whatever it works. The rescue/retry stuff was a last minute eye roller because I got an SSL error of sorts. Just keep an eye on it if it gets out of hand. Completed lists are migrated as well, so you have a record of that stuff too. It migrated my 800+ todos in my Basecamp Next project to Basecamp Personal in about 24 minutes. Now I can save some bucks in the long run.